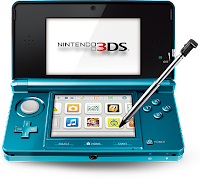 So the big bit of video game news going around this week has to be Nintendo's surprise announcement that, less than six months after the retail debut of the 3DS, the portable system will be getting a hefty price cut come August 12th. For gamers in the US, the 3DS price will drop from $249.99 to $169.99, a whopping savings of $80. To put that in a little more perspective, if you were to rush out right now and pick yourself up a DSi XL from Best Buy, you'd be paying the same amount as you would if you wait just a couple more weeks for some glasses-free 3D action. Assuming you didn't giggle like a little schoolgirl at the title of this post, you can probably guess that this one's all about the coolest cat(s) to ever defend the universe ... none other than the Voltron Force. 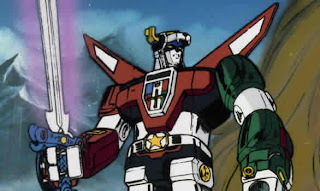 Just in time for Comic-Con, word has come out that the studio behind Scott Pilgrim vs. the World and the upcoming Cowboys & Aliens flicks has optioned the feature film rights for Voltron from World Event Productions, with plans to develop the property into a new live-action project headed for the big screen. 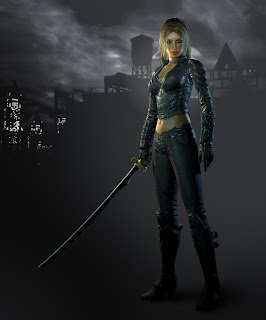 If you know me (or you've been following this blog much), you probably already know that I'm a BIG fan of DC Universe Online from Sony Online Entertainment. Hell, I've got both the PC and PS3 versions of the game, and I play both on a regular basis. The game is simply a blast to play, and you can't help but actually feel like your hero (or villain) is an active part of the DC Universe. Well, at Comic-Con this week, SOE is showing off the game's first DLC expansion back, "Fight for the Light". 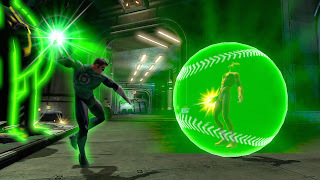 As a longtime fan of Green Lantern, I was already stoked about this before the show. Now? I'm just itchin' to join the Corps. If you think I'm just blowing smoke and you happen to be at Comic-Con, head on over to Booth #4436 and check in out for yourself. For everyone else, read on to learn what you'll be getting when "Fight for the Light" goes on sale later this Summer. More interesting news out of Comic-Con today, as we learn that the Starship Enterprise is taking a bit of a detour from its original five year mission in order to warp straight into a brand new voyage ... this time straight into the heart of the DC Universe and an encounter with a certain group of 30th century Legionnaires. That's right. 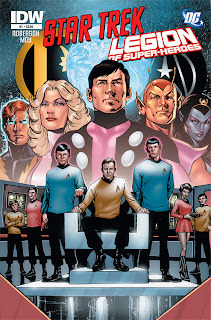 Earlier today, IDW Publishing announced its first-ever crossover with DC Comics, courtesy of the upcoming six-issue miniseries, Star Trek/Legion of Super-Heroes, beginning this October. Don't worry, continuity buffs, no one is trying to shoehorn the entirety of the Star Trek mythos into the DC Universe proper (or vice versa). As we all know, both groups have done more than their fair share of dimension hopping over the course of their respective histories, and this will be no exception. So, what's in store for both groups of space faring adventurers? With Comic-Con in full effect, it's no surprise that everyone is talking about how the comic book industry is making its mark in other media. And when it comes to video games, especially those based on popular comic book franchises, well let's just say that you'd better damn well have your act together otherwise these fans will rip you apart. One game on everyone's mind at Comic-Con this year is Batman: Arkham City, from Warner Bros. Interactive Entertainment and Rocksteady Studios. It's pretty much a given that Arkham City is going to be big ... but what about that OTHER Batman game currently in development? You know, the one from Monolith? The guys behind F.E.A.R., Tron 2.0, and both Condemned games? The one that's a first person shooter starring a bunch of Batman and Joker wannabes? You mean you haven't heard of Gotham City Impostors yet? There's no shortage of interesting news coming out of Comic-Con this year. And I'll be honest, there's WAY too much for me to cover it all. I'll be doing what I can here and there in between assignments too, so I can update this blog with those little personal bits that I come across which seem pretty cool. This particular tidbit falls squarely into that "I Think It's Cool!!" category. What is it? Why, it's a Star Wars Xbox 360! !